There are many words such as tulip, windmill, a country that has fourth of its land lower than sea level, and one of the top soccer countries that represent Netherland. It is a country that also has competitive edge in technologies and resources as it has companies such as Philips, Royal Dutch Shell, and ASML. There is no need to say something twice about its dairy farming industry. However, not many people know that it is a country with leading blockchain industry in the world. Netherland has been preparing blockchain industry based on its technical skills and industrial competitive edge. It formed The Dutch Blockchain Coalition last year under guidance from its ministry of economy and it set up digitalization of personal information, creation of environments for vitalizing blockchain, and finding of human resources as the coalition’s main goals. Unlike this trend, ‘De Ceuvel’ is a place that demonstrates blockchain technology and is composed of private companies. It is called ‘Ceuvel Town’ in Korean. 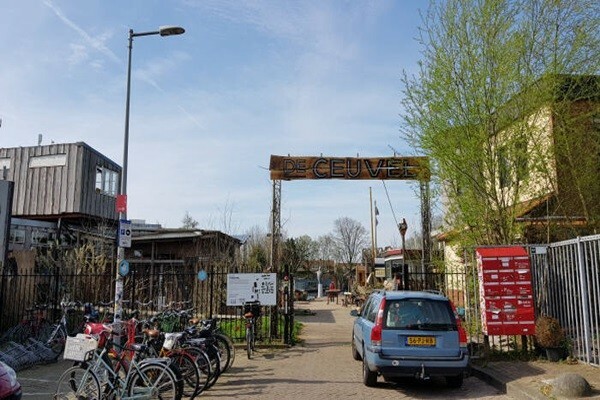 De Ceuvel has turned into a sustainable community after its land was polluted with shipyard and it incorporated blockchain concept into its energy sharing business. De Ceuvel is loated at a small port, which is one bus exit away from the central station in Amsterdam and it is filled with cafes, lodgings, workshops, and startups. It is sort of similar to an initial form of Heyri Town in Paju. De Ceuvel is very popular amongst tourists who visit Netherland. De Ceuvel is composed of ‘Houseboat’, which is an unique housing type in Netherland that has many canals. Houseboat type is when a house is placed on top of a boat. Many wooden decks surround Houseboats. Many solar panels are installed on top of roofs of Houseboats. Not all Houseboats such as ones with narrow roofs and ones under share of trees have solar panels. This indicates that energy is provided for houses that produce relatively lower energy than other houses. Every history of energy sharing is recorded into blockchain. Measurement of energy is measured by an electronic watt-hour meter called ‘Smart Meter’, which is developed by Spectral and Alliander. Current states of production and consumption of energy are provided through a community map. This map indicates Houseboats that have more amount of energy produced than amount of energy spent through solar generation as green and it shows which direction energy is flowing to. It also provides the name of a house and amount of energy produced and consumed whenever a mouse is placed over a Houseboat. It shows the shape of a Houseboat, amount of solar energy generated, and breakdown of energy consumed as pictures and graphs whenever a particular building is clicked. Consumption of energy can be seen as air conditioning and heating or home appliances. Every house in this community increased number of skylights and changed their lights to LED to reduce amount of consumption of energy. Entire amount of energy spent is shown whenever a transmission tower icon located at the bottom of a screen is clicked. Whenever there is more amount of energy spent than amount of energy produced, this tower is in red color. Otherwise, it is in green color. If there is no generation due to no sunlight and clouds, it also turns into red color. Cryptocurrency called ‘Jouliette’ is paid to each account based on records that are shared between Houseboats. The term ‘Jouliette’ comes from joule, which is a unit for energy. 1 Jouliette is equaled to 1 kWh. Jouliette is issued depending on an amount of energy produced and it is either deducted or added to a wallet depending on an amount of energy shared. Unlike current solar energy generating businesses, surplus amount of energy produced is not resold within this community. Rather, community is designed so that surplus amount of energy produced is exchanged amongst the community. Besides energy sharing, Jouliette is also used to exchange for necessary goods. Energy can also be used to purchase food or drinks from ‘Café De Ceuvel’, which is the biggest building within De Ceuvel. Cafes that require large amount of energy provide food or drinks in exchange for energy from surrounding Houseboats. Although a payment system has not been established, it will be possible to purchase goods from cafes with Jouliette when a payment system is installed by end of this month. De Ceuvel also prepared a plan to add batteries to Houseboats. As of now, energy that is produced is consumed immediately. When batteries are installed, Houseboats can save energy into batteries whenever there is large amount of sunshine and use stored energy whenever it is necessary.